Carol O’Dell, author of her debut memoir Mothering Mother, will make you laugh and cry. Her heartfelt chronicle about caring for her dying mother is an emotional tribute to self-sacrifice and a daughter’s unfailing love―an adopted daughter’s love, to be more precise. Carol’s mother adopted her late in life and raised her in a strict, religious environment. But it perhaps is their faith that kept them all together until the end. Although she has her faults and may seem somewhat cool at times, Mama did the best she could, and I think that is the realization that the author has come to. And certainly, it is what we all should hope to conclude at the end of our parents’ lives. The author shows us her own strength and her weaknesses, baring her thoughts, her emotions, her decisions and her very soul in a way that takes more courage than many of us would have. A loving daughter with a mother who suffers from Parkinson’s and Alzheimer’s, she takes her mother into her home, working around a husband and kids, and fighting the inevitable. Faced with the deteriorating health of a stubborn mother, Carol is faced with countless tasks in any given day or night, tasks that threaten to destroy her physically, mentally and spiritually. Many of the anecdotes are charming and hilarious, while others are heartbreakingly sad. I recently bought a copy for my own mother―for Mother’s Day―even though my mom is healthy, still working and independent. And while this may seem a strange gift, I felt that Carol O’Dell’s book shows a glimmer of light at the end of what most people view as a dark tunnel. She shows that sometimes being prepared is half the battle. Perhaps then, many of us would not feel as though too many things were left undone, unsaid…unforgiven. 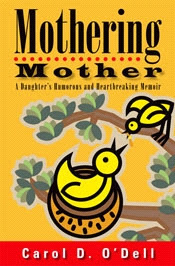 Mothering Mother is a beautiful story, a true story, of how love can conquer even death. I’ve never laughed and cried at the same time so much. It made me want to call my mom and tell her how much I love her. It made me talk to my daughter and tell her that if she ever had to care for me and felt that I was too much of a burden, that it was okay to look for alternate care. I’ll be honest; I normally don’t read a lot of memoirs. I often find them hard to relate to. But I LOVED Mothering Mother! It is the type of book that everyone should read. It will stay with you long after you have put it down. And for those caring for aging or dying parents, it will give you hope and remind you that you are not alone―someone else has traveled this path…and she survived. So can you. Authors' Row, created by Cheryl Kaye Tardif, at the Edmonton Woman's Show! Can I tell you a secret? Shhh...promise not to tell. Ok, I do realize that once I mention it here it won't be a secret anymore, but I will share with you that I have completed a new suspense thriller. It is called Children of the Fog, and it explores how far a mother is willing to go for her child. A mother's descent into alcoholism and madness leads to strange apparitions and a face-to-face encounter with the monster who abducted her son--a man known only as...The Fog. Children of the Fog is with my new publisher, Kunati Books, and so now I must sit patiently and wait. Ok, can someone please tell me how to do that? Well, I have a plan...I am now working on the long overdue Divine Justice! Four days after the launch of Whale Song, it makes the Bestsellers list on Amazon.ca. Not only have sales been phenomenal, the first print run is nearly sold out. And now Amazon.ca has Whale Song listed as a bestseller in Canadian fiction. Whale Song on Amazon.ca's Best Seller list...? When I went to my book signing today, one of the Indigo staff said that they'd heard that Whale Song was a best seller on Amazon.ca in fiction over the weekend. I had seen the rank last night and knew it was close, but apparently it was so low it made the list! So now, I invite you all to order from Amazon.ca and help me get that rank down so I can see my name on that list. :) Plus, Whale Song is on sale!! Get Whale Song for only $12.37 CDN, plus FREE shipping for orders of $39.00 or more. Whale Song is nearly sold out of its first print run, so order now. Whale Song Book Launch Sells Out! The food was fantastic, thanks to Victor Guan Catering. Jessy Tardif (my daughter) and singer-songwriter Alexia Melnychuk had fabulous performances and the audience just loved them. This was my daughter's first singing performance. She did an acoustic performance at my launch in 2005 for The River. Thank you everyone for being so supportive and complimentary. She was very nervous. As for Alexia, she's a seasoned pro on her way to the top. I was happy to see she sold some of her CD's and I recommend Flying Machine to everyone! I enjoy writing to it. Rachel, the manager of South Point Chapters in Edmonton, AB, gave me such a glowing introduction I was stunned. (And that doesn't happen a lot. :) I hope I made her proud. Her store is one of my favorite places to do signings because I am always treated like gold. She always has a smile and her staff is wonderful. Although we sold out, more copies of Whale Song will be coming in soon...and I did leave her 6 copies. The door prizes were a huge hit...I had so many that almost everyone went home with something. But best of all for me was seeing my fans--some old, some new...and seeing people who have supported my work since the beginning. To all of you, I thank you for taking time out of your Easter holiday to come down and support me. I so appreciate it and I really hope you all enjoy Whale Song...and the mystery gift that many of you received for buying 2+ copies. I had lovely mugs made with the cover of Whale Song on the side and my websites listed on the other side.